Russian fans threaten the image of Russian soccer at the international level. On Nov. 17, a Russian League game between Dynamo (Moscow) and Zenit (St. Petersburg) led to an incident that will remain etched in the memory of Russian fans’ forever. From the very beginning of the match, different inappropriate objects such as coins, metal bearings, cigarette lighters and firecrackers were being thrown onto the field from the stands of the Arena Khimki stadium. One of the firecrackers thrown hit Russia’s national team goalkeeper, Anton Shunin. He lost consciousness for some time, but Dynamo physicians managed to bring him back to consciousness 15 minutes later. The game’s referee, Alexei Nikolaev, decided to stop the match and take the teams off the field. A medical check revealed that Shunin had suffered a chemical burn to his corneas and partial hearing loss. This is not the first act of violence from Russian fans this year. In Novogorsk (Moscow Region), unknown spectators fired at Dynamo players with paintball guns, because of poor results in the match. Dark-skinned players have had bananas thrown at them and Caucasian teams have suffered from insults and taken to whistling in response to the Russian anthem being played. UEFA matches played by Anzhi from Makhachkala, Dagestan are attended by Russian fans that cheer against the Caucasian team and thus provoke their fellow countrymen into mass brawls. The incident with the thrown firecracker, however, has become the peak of fan aggression. During a special meeting dedicated to fans’ behavior, Russian Premier League President Sergei Pryadkin maintained that this cannot go on any longer. “The incident with the firecracker thrown at Anton Shunin became the pivotal point. This cannot continue any longer. From now on, guest clubs will have to sell tickets to the guest sector on their own. The purchase of tickets will be available only after providing passport data, and if some fans violate the League regulations, the team will play the next game with no spectators,” Pryadkin said. These decisions made by the Russian League do not follow international trends. In Western Europe, no passport is required to buy a ticket and matches behind closed doors are played once in five years. The situation is more complicated in Russia. Big money was poured into Russian soccer and made the country’s championship attractive for foreign soccer stars. For instance, famous German striker Kevin Kurányi, French national team halfback Lassana Diarra, Brazilian national team striker Hulk, and two-time winner of the most prestigious European tournament (UEFA Champions League), Cameroonian Samuel Eto’o, all came to Russia. In December 2010, the country also won the right to host the 2018 FIFA World Cup. Having rapidly achieved some progress, Russia might lose it with the same speed. Poor security at Russian stadiums and the low level of responsibility demonstrated by Russian fans might not only deter foreign stars, but they may also become a serious encumbrance during the country’s preparation for the World Cup. 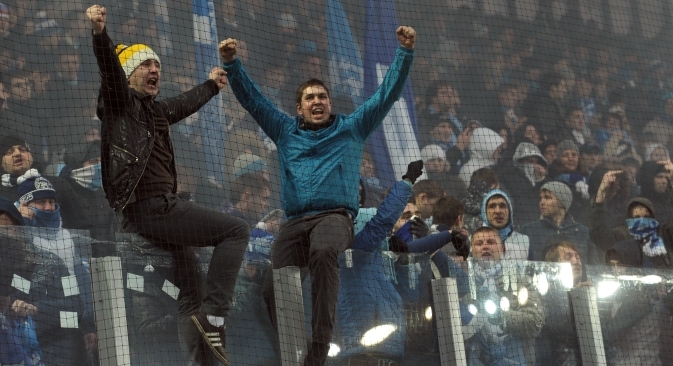 One of the Zenit fan-club leaders, Edvard Serzhan, sees no differences between Russian and Western fans. In his opinion, the people involved in the recent scandals surrounding Russian soccer are hardly connected with the fan movement. “People who throw firecrackers and commit other illegal acts are rather hollow. They do not need football, they know nothing about the team they come to cheer for. All they are interested in is hooliganism: to light a firecracker, to throw a banana or to abuse an opponent. It is a pity that all Russian fans are associated with these people. I guarantee such people are also found in Western Europe. True fans devote all their energies to support their team, but not to provoke rivals,” said Serzhan. True fans and hooligans alike may soon have new rules to adhere to at soccer matches, as a federal law regarding soccer fans is to be adopted in Russia in the near future.